a Ceremony of Remembrance that spans over 2 weeks and 330 miles. It is a journey, with horses. but it is so much more than a horseback ride. It is about men and women on horses winding their way from a place of exile to a place of shame. It is about remembrance of the past and hope for healing and a future. 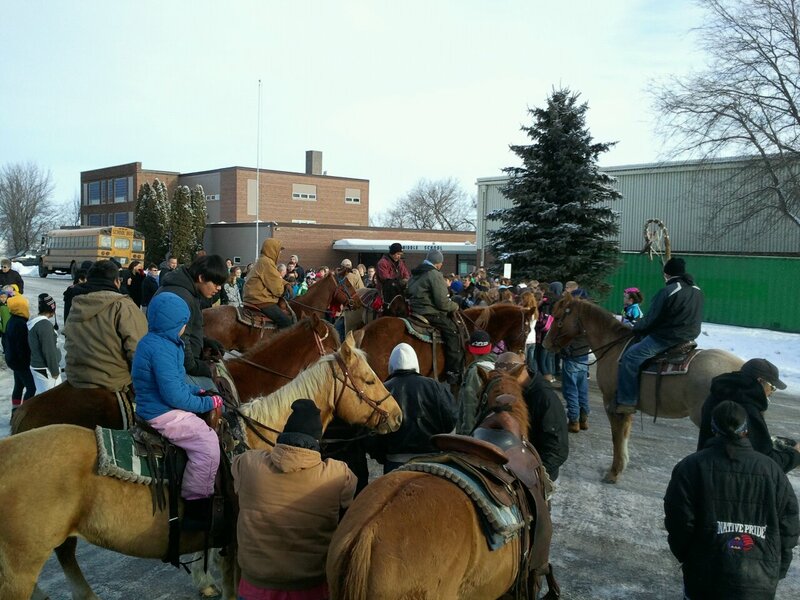 The Dakota 38 +2 Memorial Ride will begin December 10 near Fort Thompson. South Dakota and end December 26 in Mankato MN. A few years back, I was honored to participate in all but two days of the ride. Over the past 15 years I have had a gradual awakening of the events of 1862 that led to the execution of 38 Dakota warriors in Mankato and the exile of all the Dakota people from the state of Minnesota. You can read more about the Dakota MN war and its consequences here and more about the experience I had on the ride here, as well as in several of the adjoining posts. During the ride the staff bearer, Peter Lengkeek consistently stated that this is a ride for healing and reconciliation. I recall sever times he addressed the descendants of the white settlers who had benefited from the short war that had decimated his Dakota ancestors, “We want to be the first to say we are sorry.” I watched again and again as these farmers and small town residents came to tears and said, “No, I am sorry.” Reconciliation is happening, remembrance which leads to healing is beginning to flow. Peter would point out to us how this annual ceremony is changing hearts and attitudes. He told of towns that just a few years ago shamed the riders as they passed through, now offered welcomes with food for horses and riders alike. He also spoke of young people from the reservations who once were filled with shame and lacked pride in their heritage, who now are proud to be Dakota – understanding the beauty and power of their people. Healing and Reconciliation through Rembrance. There is something concrete you can do in this journey for healing through remembrance. Support the Dakota Wokiksuye, the 38+2 Memorial ride, there are great expenses that go with a caravan of over 40 people and horses traveling over 330 miles, but as you can see the benefits are significant and eternal. If you are able to give financially follow this link. $500 can fund housing at the Hotels and Community centers that often give discounted rates to the riders. In addition to helping with meals and housing just come out to offer the support of presence. As a rider I know how wonderful it is to see people standing along the roads just to smile and wave or offer a warm coffee and I’ve heard from others the impact that presence has to heal and bring affirmation to the Dakota. Should you be able to come to Mankato on December 26 here are some suggestions for making the most of your time there. We cannot undo the past we have inherited, but we can begin to undo its legacy. We can build understanding, create opportunities for healing and seek ways to restore opportunity and dignity to all. This is the way to Beloved Community. This is incredible. So glad I learned about this and even more glad you all are doing it. I will spread the word. Aho. Thank you for this. Did you know there a whole week missing in the schedule? Obviously I can read it, but can yu possibly post it larger? I and my Brother would love to be there. I’m not sure where the missing page is at. Do you live in the area?